Last week a paper I co-authored with Donggen Wang at Hong Kong Baptist University has appeared in the Annals of American Geographers. In this paper we argue that the Day Reconstruction Method devised by Daniel Kahneman and colleagues can be usefully linked to time-geography. One benefit of doing this is that what Mei-Po Kwan calls the Uncertain Geographical Context Problem (UGCoP) — spatiotemporal uncertainty in the actual areas or places that exert influence on the behaviour and experiences of individuals — that has characterised past studies of the geographical context on individuals’ subjectively experienced well-being. Another benefit is that the effect of spending time together with others (family members or friends) on one’s subjectively experienced well-being can be measured and examined more precisely. Using data from Hong Kong we found that the influence of the actual location where people spend time for daily activities other than paid work is very limited (at least as far as we were able to measure characteristics of that location); the effect of where individuals live on their overall life satisfaction was much stronger. Further work is therefore required to better measure and examine how the places where people spend time affects their subjective experience of well-being. We did find that doing things together with others makes them happier than doing the same things alone, and it also appears that the relationship between the duration of a daily activity and people’s subjectively experienced well-being depends on with how they have undertaken that activity. One implication of this finding is that the relationships between social capital and subjectively experienced well-being cannot be examined or understood properly without due attention for individuals’ everyday life — i.e. their actual time-use and space-time path. A limited number of free copies of the article is now available from here. Happy 2014! It has been a while since my last post, which is largely because I have been in Hong Kong for most of December to work on some joint research with Prof Donggen Wang on well-being and to attend two conferences. 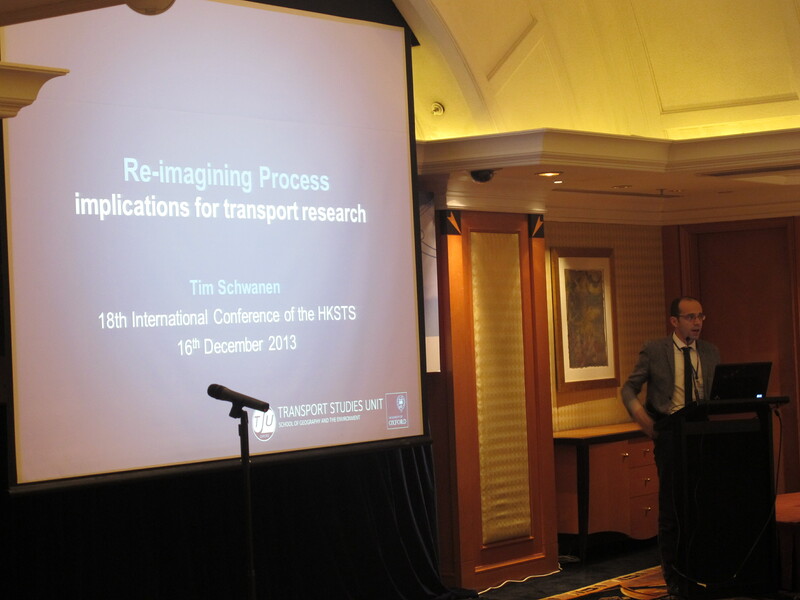 I gave a plenary during the 18th Conference of the Hong Kong Society for Transportation Studies on the insights that can be derived from Whitehead’s philosophy for the analysis of processes of change in transport (see picture). And on the day prior to the main conference I gave a keynote on how I believe activity analysis in transport studies should be reconfigured so that we can better understand how socio-technical innovations in urban transport (e.g. car sharing schemes or electric vehicles) change, develop and diffuse over time in particular places. I will probably discuss this work in a later post. Apart from working and attending conferences, I have also had the opportunity to experience the fantastic city that is Hong Kong — a paradise for urban geographers interested in processes of urban expansion, growing sociospatial inequality and low carbon urban mobility. I visited Hong Kong in 1998, just after the hand-over, but the city has changed almost unrecognisably since: it has grown in terms of population size, ‘neoliberal’ urban (re)development projects are now much more common, social inequalities have increased markedly, and the city has become much more Chinese than it was in my memory. It has not, however, lost any of its positive energy. If anything, its vitality has only increased and easily surpasses that of Europe’s major cities. It is now truly a global city where East and West mingle in all kinds of innovative and inspiring ways! In ths post I would like to plug an article on independence in later life by David Banister, Ann Bowling and myself that has recently been published in the ‘in press’ section of the journal Geoforum. In this article we interrogate independence — what it means to community dwelling older people and how they practice it. The paper starts with a review of the conceptualisations of independence in the academic literature. We juxtapose individualist-liberal understandings that circulate through the medical realm and/or are inspired by the thinking of Immanuel Kant and John Stuart Mill with non-modernist understandings in post-structuralist social theory. We then continue with an analysis of in-depth interviews with people aged 70 and over from across England (and Scotland). The paper argues that independence is much more than not being dependent on others — next of kin, friends, neighbours, and so forth. But what exactly its meanings are, is difficult to ascertain. For these are fuzzy, fluid and shifting, and cannot be pinpointed or arrested through language. It is therefore important to also consider how independence is ‘done’, how it is practised. To this end, we draw on actor-network theory (among others) and argue that independence is an unstable outcome of attachments to, and dependencies on, bodies, technologies, infrastructures and so forth. The upshot of this is that dependence is primordial to independence: without dependencies no independence. This has political import: It puts the positioning of independence in later life as natural or a necessary ingredient of successful or healthy ageing in a different light, and helps in resisting the widespread tendency of considering forms of dependency in later life as undesirable. Our point is of course not to celebrate dependencies as such. That would amount to making the same mistake as the naïve positioning of independence in later life as inherently good and desirable. That would also mean treating all dependencies as equal and being oblivious to the complex power asymmetries that mediate (and are constituted by) dependencies. The point is rather to criticise understandings of dependency in later life in terms of passivity, burden and undesirability — understandings that work to disadvantage older people (and others) who cannot act and behave in line with the (socially produced) ideal of independence. In the paper we illustrate and elaborate our arguments with reference to everyday mobility — i.e. trips to places outside the house. We also elaborate an alternative conceptualisation of independence and independent mobility that, we feel, does more justice to the myriad dependencies that make possible independence and autonomy in relation to movement through space. Further conceptual and empirical work remains to be done with regard to independence in later life, both in relation to out-of-home mobility and with regard to other domains of everyday life. I hope, however, that this paper helps people to use the term independence with more care and circumspection. Next week the Annual Meeting of the Association of American Geographers will take place in New York. This always is a highlight of the year, and the upcoming edition is particularly exciting as I am convening three sessions on a topic that I have become very fascinated by over the past three years – the geographies of wellbeing. The sessions are scheduled to take place on Sunday 26th February between 12:40 pm and 6:20 pm (local time) in the Carnegie Suite West on the third floor of the Sheraton Hotel. I am fortunate to have excellent speakers giving papers, including Sarah Atkinson, Jo Little, Sebastien Fleuret and many others.